After the Sacramento News & Review article about PGEW back in March, fun little things started to happen. I was contacted for other, smaller interviews; people started emailing me for cooking advice; and I received a wonderful invitation to visit a rather reputable restaurant by the name of Hawks. I was very excited to know that a restaurant like Hawks would want me to come and check them out; they’ve received a number of excellent reviews in the past and a glance at the photos on their website was all I needed to know this was a must-visit restaurant. Unfortunately, I knew it would be awhile before I could actually take them up on their offer because Hawks is located all the way out in Granite Bay, which is nowhere near this car-less, city mouse's house. But things have a way of working out; I've scored a part-time gig that gives me access to a car every so often (this weekend included), so I figured it was the perfect time to head out to the suburbs and join the folks at Hawks for one of their Sunday Suppers. On Sundays, the chefs at Hawks give the regular menu a rest and create a special, 4-course dinner that changes weekly. Served family style, these meals offer diners a chance to experience something different from the usual menu at a wonderfully affordable price. Priced between $35 and $40, Hawks has made it possible for folks to have a fine dining experience at prices that won't completely break the bank. From the subtly elegant décor of soft blues with classic, dark woodwork and lovely views of the patio and reflecting pool, to the impeccable service offered by their friendly and knowledgeable staff, you’re guaranteed a sophisticated, yet unpretentious atmosphere in which to enjoy Hawks’ best feature: the food. We started out with a couple of drinks before our amuse bouche was brought to us. My friend ordered a house pilsner, and I ordered their Meyer Lemon Limoncello Lemon Drop. I was torn between getting that and having their vodka martini with bleu cheese stuffed olives (you know how I feel about my vodka martinis); however, the idea of enjoying a homemade limoncello was too good to pass up, so I treated myself to something new. It was a phenomenal drink that was not too sweet and not too sour, and it reminded me to add how to make homemade limoncello to my To Do list. Our amuse bouche was a lovely little mango salad with just a touch of paprika and fresh herbs, just the right touch for such a hot summer day. 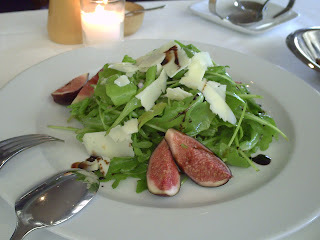 It was followed by the arugula salad, the sweetness of the fresh figs and sharpness of the pecorino complementing each other beautifully, the vinaigrette light and perfectly balanced. Some restaurant vinaigrettes lack that balance, some being far too oily, others almost impossible to eat because the amount of vinegar is too overwhelming, so it was nice to be able to enjoy a properly prepared vinaigrette. 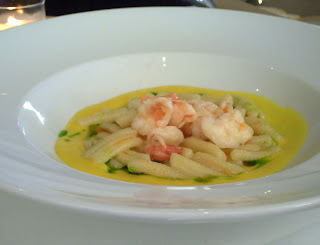 The second course was the house-made cavatelli with butter poached shrimp and yellow peppers. Since I’m on a sweet pepper kick these days, I was looking forward to this dish quite a bit. The menu was a bit misleading since the peppers were actually a sauce, but what a deliciously lovely dish! The shrimp were cooked to perfection, tender and sweet with just a kiss of butter, the cavatelli delightful, and the yellow pepper sauce simply scrumptious. Beautiful, light, and bright yellow, this sauce was full of flavor with only the tiniest kick of spiciness in the background. I plan on recreating this at home at some point, as it’s a great departure from the traditional red tomato or red pepper sauces commonly used on pasta. Our entrée proved to be yet another exquisite dish. Seldom does one find such beautifully cooked steak without having to tell your server the exact way one likes it. The Kobe beef sirloin steak was so tender it practically melted in our mouths, seasoned just enough to enhance its flavor without overwhelming it. 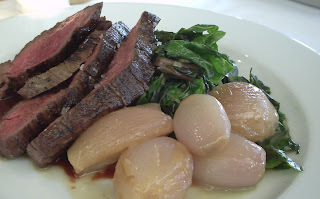 Accompanied by the sweet roasted shallots and the deliciously prepared Swiss chard, this entrée was satisfying yet light, leaving plenty of room for the most important meal of the day: dessert. I’ve never really been the biggest fan of panna cotta, so I was a little hesitant to try this dessert. The few times I’ve had it at other restaurants it seemed far too heavy and bland, with an almost chalky aftertaste. Perhaps I was not meant to have a properly prepared panna cotta until now, and I’m happy to report that my opinion of this creamy dessert has officially changed. 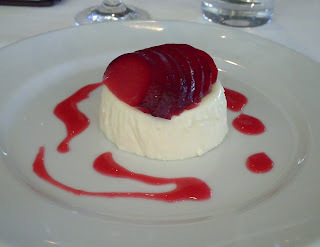 The panna cotta was light and fluffy, the lemon flavor a lovely enhancement to the creamy texture. For me, the star of the dessert show was the lovely addition of locally grown red plums. A gorgeous ruby red, they were the right balance of tart and sweet, jazzing up the mild panna cotta for a simply delectable ending to an amazing meal. After dinner, we briefly spoke with Chef Mike Fagnoni, who kindly let me in on some of his preparation techniques (because truthfully, my shallots would have probably never turned out the way his did without some explanation). As he was one of just two people working in the kitchen that evening, he had to leave quickly; however, it gave us a chance to let him know we’d both noticed how this menu format is actually quite good for a restaurant of Hawks’ caliber. Not only do the Sunday Suppers give their patrons a change from the norm in addition to the price break, it also allows the restaurant to cut back a bit without having to change much in the way of schedules and prices. In this struggling economy, it seems to me that more fine dining restaurants should look into something similar to these Sunday Suppers. With many restaurants suffering from a decrease in clientele, this is a wonderful way to attract new customers and keep their devotees. wow. That dessert is exquisite! I wish Sacramento wasn't so far from San Diego! I would definitely go! 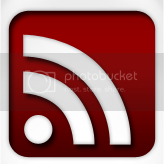 Nice write up. If hubby and I make it to Sacramento one of these days, we will hit up Hawks. Thanks!